Scientists have discovered neurons in the Lateral Intraparietal Cortex that helps the brain keep track of time. 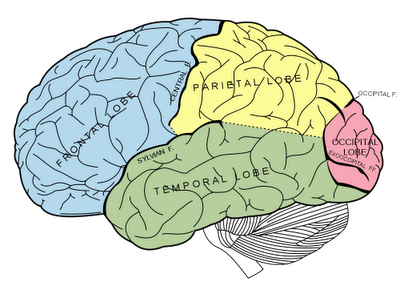 Within the IPS region is an area called the Lateral Intraparietal Cortex (area LIP). This part of the brain controls the visual attention and saccadic eye movements. Saccadic eye movements are fast uncontrolled movements of the eye so that an object being observed can be processed by the brain with greater resolution. Our bodies often perform functions based on internal timing mechanisms that does not rely on outside cues or signals. The functions based on the body's circadian rhythm such as hunger, bowel movement, and sleeping and waking hours mostly rely on this internal clock. Despite the lack of sensory information, the body is consistent and precise in performing these timed biological functions. But in order to do this, the brain must still be able to represent the passage of time. Researchers at the University of Minnesota's Center for Magnetic Resonance Research (CMRR) noted in their study published in the open access journal PLOS Biology that the brain's Lateral Intraparietal Cortex is the one responsible for time keeping. They found a small population of neurons that is involved in measuring time. This time measuring process has traditionally been difficult to study and observe in the lab. Using trained monkeys that could only use their innate sense in keeping track of time, the researchers designed a task that ignores and eliminates all external signals and outside stimuli the monkeys can use to measure time. The task involves the monkeys having to move their eyes in regular time intervals relying only on the brains own "internal clock". They found that even without any outside signal or cue to rely on, the monkeys were consistently precise in their timed behaviors. This consistency could be explained by activity in the lateral intraparietal area (LIP). Interestingly, the researchers found that LIP activity during their task was different from activity in previous studies that had failed to eliminate external cues or expectation of reward. "In contrast to previous studies that observed a build-up of activity associated with the passage of time, we found that LIP activity decreased at a constant rate between timed movements," said lead researcher Geoffrey Ghose, Ph.D., associate professor of neuroscience at the University of Minnesota. "Importantly, the animals' timing varied after these neurons were more, or less, active. It's as if the activity of these neurons was serving as an internal hourglass." By developing a model to help explain the differences in timing signals they see relative to previous studies, their study also suggests that there is no "central clock" in the brain that is relied upon for all tasks involving timing. Instead, it appears as though each of the brain's circuits responsible for different actions are capable of independently producing an accurate timing signal. One important direction for future research is to explore how such precise timing signals arise as a consequence of practice and learning, and whether, when the signals are altered, there are clear effects on behavior.